So it’s been over a week since I’ve seen this movie and and if you haven’t seen this movie yet, you should! If I know you and you haven’t seen this movie yet, do remind me to smack you a few times the next time we meet. I’ll try to give you readers heads up before any spoiler, but if you’ve seen any of the trailers, you practically know the whole story already. Why should you watch the movie then? Though the story is important, the experience and execution was just fantastic. By the way, I’m serious about reminding me to slap you if you haven’t seen the movie yet. My friends and I had been planning to watch The Dark Knight at IMAX for some time. We had plans to go watch it on the opening weekend. With my employee discount, I found out I was able to get IMAX tickets at a major discount. Normally $10.75 (which is exceptionally cheap already considering typical movie tickets are $9+), I was able to get tickets at $3. However, I was only limit to 2 tickets per Prime card and my coworker said I could borrow his to get 2 more. Everything was set. We had planned to go 3-4 hours before the showing to get tickets, since it was opening weekend. Boy were we disappointed to find out that on Thursday, IMAX tickets for Friday, Saturday, and Sunday showings were all already sold out. To use my employee discount, I had to purchase them in person at the IMAX theater. Talking it over with my friends, we decided we should try to catch it on a weekday evening. By Friday, Monday’s evening tickets were already sold out and by Saturday morning, Tuesday’s evening tickets were already sold out. We decided we’d tried to get some tickets for Thursday evening. Before I left, I had checked online and Thursday’s 7pm showing still had openings. However we got side tracked by Bite of Seattle, that by the time we went to purchase tickets, the 7pm showing was already sold out. So we opted for the 10pm showing instead. Which was a good thing I suppose since they recommended that we arrive 1.5hrs early if we wanted decent seats and given that we had 9 people in our group. With tickets secured, the next thing we had to do was to make sure people didn’t spoil it for us. I avoided clicking on any link on Digg that mentioned The Dark Knight. Well, that’s not true. I clicked on the links that talked about how well it did, like how it broke records of all sorts (Best Opening Night, Best Opening Weekend, #1 on IMDb, etc.) I also gave friends an ultimatum that if they spoiled it for me, it could be the end of our friendship. Most of the scenes that were shot in IMAX were overviews of the city and those were just spectacular. However I was most impressed by the opening segment, with the bank robbery. That whole 6-7 minute scene was shot in IMAX and it was so beautiful! I did notice a couple of differences between the IMAX and standard parts. Besides the fact it’s much higher resolution making it crisper and sharper, the aspect ratio is also different. It’s not your standard 16:9 that the rest of the movie was in, but was much closer to 4:3 (aspect ratio of standard TV). If you’re looking for the transition, you will see it switch between IMAX and standard film by looking out for the top/bottom bars disappearing and a change in picture quality. However it’s very subtle and the transitions are done extremely well. 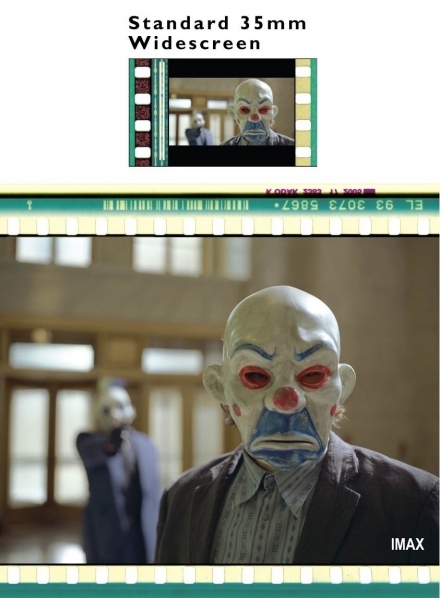 Standard film uses 35mm, but IMAX film uses 70mm and instead of shooting them vertically, they’re shot horizontally. To see a comparison of the different film sizes, check out: IMAX – How Does It Work? The camera that films IMAX weighs almost 2 tons. IMAX theaters are usually at least 6-8 stories tall, much bigger than your standard theater. IMAX theaters comes in 2 forms: Dome vs Flat. Flat is like your normal theater where the screen is flat in the front. With Dome, it is used more for immersion experiences where it covers all your peripheral vision. Did I mention how beautiful it is already? I might as well stick in the big spoiler warning now. Lets get the most awesome thing out of the way first. DID YOU SEE THE MOTORCYCLE SCENE?!?! I totally did not expect the Batpod to pop out of the tumbler. And then when he pulled the 180 turn by popping off the wall, JUST WOW! I’m not going to bother giving you a detailed summary of what happens. For that, all you need to do is watch the trailers. Let’s jump to some things that have bothered me. I had not expected Harvey Dent to die. Throughout the story, they make it obviously clear that Batman does NOT kill. They even made him save the Joker from falling to his death. However with Harvey Dent’s death, it becomes quite clear that Batman has now dirtied his hands. Batman: [looks back to Gordon] And you’ll never have to. Now jumping over to the Joker. RayAlome had asked me whose performance did I think was the best and although Christian Bale’s performance was excellent, Heath Ledger was just amazing. It was ingenious how the Joker just randomly makes up stories on how he got his scars and how he became what he is today. Thinking back to the scene where Batman has to make a choice to either save Harvey Dent or Rachel Dawes, and the Joker purposely switches the addresses, so Batman ends up saving Harvey Dent instead of Rachel. This got me thinking… Rachel knew that Batman would come to save her and told Harvey to try his best to get freed. Harvey Dent, not knowing the relationship between Batman and Rachel, assumed they would definitely come for him first, but said they’ll definitely go save Rachel instead to comfort her. This was reconfirmed when Harvey asks Batman in the final scene why he didn’t go save Rachel, but Harvey already knew the answer (but not the real one). This played out extremely well in my opinion. Since I’m Chinese, I noticed the the dialect they used during the scenes in Hong Kong was not Cantonese, but was Mandarin. Given that the main spoken dialect in Hong Kong is Cantonese, I would’ve expected them to speak mostly that. There were some Cantonese lines and that’s when I noticed Edison Chen (陳冠希) as a security guard in the movie. The bullet reconstruction scene confused me. I understand he was trying to reconstruct the bullet to find the fingerprint, but before that he shot different bullets at different walls to figure out which bullet type it was. What was the purpose of finding out the bullet type if you already have all the pieces of the bullet? They made a big deal about how Batman’s new body armor was more prone to knife attacks and given that the Joker had nothing more than knives and lint on him, I’m surprised Batman never got injured by a knife. RayAlome brought up the question about if Alfred destroying Rachel’s letter was the correct thing to do. Given that Rachel is dead now, I believe it’s the correct thing to do. I’m not sure how many of you have watched Rurouni Kenshin, especially the first OVA (Trust & Betrayal), one of the themes was that Tomoe would become Kenshin’s sheath. To give a little more context, Kenshin was an assassin during the Meiji revolution. He worked directly under one of the revolutionary leaders. The leader saw Kenshin as a raw blade and didn’t want Kenshin to lose himself into this madness. He hired Tomoe become Kenshin’s sheath, to hold him back when necessary and bring him back into reality. Tomoe ends up dying (actually being sliced in half by Kenshin, but not on purpose), but for the rest of Kenshin’s life, Tomoe has done her part and is continuously doing her part to bring Kenshin back to humanity and keeping him sane. Rachel says earlier in the movie, “Bruce, don’t make me your only hope for a normal life.” I think in times when Bruce is about to go crazy and insane, memories of Rachel will be the one bringing him back to humanity. The scene of the 2 boats armed with bombs and detonators was very moving, especially when the big inmate came and threw the detonator out the window into the water. Late in the movie, Bruce builds a system to use all the cell phones in Gotham city as little sonar devices to spy on people to figure out where the Joker is. When Fox found out, he said this was too much power for one man to have. Batman gave the power of destroying it to Fox, but right now he was determined to find the Joker. Fox agreed to help but said something along the lines of, “Consider this my last act and my resignation.” This was never retracted and in the final scenes, you see Fox walking away from the array of monitors shutting off, which leads me to think he is actually resigning. Batman will probably have to win him back somehow in the 3rd movie. There was an article on /. on the similarities of this and our current government on how so many of our freedoms and liberties are taken away justified by the fact it’s helping us catch terrorists. Someone commented that The Patriot Act should only be used to capture Osama Bin Laden and France would hold the keys to destroy it once the deed is done or when they deemed it abused. I was also surprised that part of Gordon’s team was corrupted. I thought his men were handpicked and fully trustable. I mean even Internal Affairs was investigating his men and I’m not sure why Gordon wouldn’t have cooperated with the investigation given that 90% of the cops before were corrupt. Because of this, we ended up losing both Rachel and Harvey Dent. The music was once again composed by Hans Zimmer and James Newton Howard. However instead of giving the tracks names with names after different bat genus/species (i.e. Molossus, Myotis, Eptesicus, Vespertilio) as in the Batman Begins Soundtrack, they named tracks after famous quotes from the movie (i.e. Why So Serious?). The music was darker and heavier than the original. For some reason I find myself liking the original one better. Maybe it’ll just takes some time for this soundtrack to grow on me. I read somewhere that the main Batman theme song was only played twice throughout the movie because the main theme song didn’t give the dark feeling that the movie needed. This movie instantly became one of my favorites, probably #2 or #3. I would definitely recommend anyone that hasn’t seen it to go see it. The hype is all REAL! I just watched Makoto Shinkai’s latest masterpiece: 5 Centimeters Per Second (秒速５センチメートル). You might remember Makoto Shinkai from his previous works such as Voices of a Distant Star (ほしのこえ) or The Place Promised in Our Early Days (雲のむこう、約束の場所). This animated film was so beautiful, yet so heart wrenching, and I think I’m going to be depressed for some time. The drawing was just spectacular and the music/soundtrack was nothing short of Tenmon‘s best. The storyline was so amazingly beautiful, I’m not sure exactly how I feel with such an open ended ending. The main theme of this story is that time and distance is very relative. Something can be very close, but you’d never be able to reach it. Other times, a minute can seem like an eternity. Here are the Teaser or Trailer. Did you know that sakura (cherry blossom) petals fall at a rate of 5cm/second? The story starts off with 2 elementary school friends: a boy named Takaki and a girl named Akari. They’re only friends were each other and when Akari tells Takaki that she was moving after elementary school graduation, it was very painful to watch. A series of letters go between them during middle school and Takaki finally decides to go visit her. It required transferring several trains and he was expected to get their by 7pm. However an unexpected snow storm caused delays and the closer he got, the worse the situation was. There was a point the train was stuck in the middle of nowhere for 2 hours. Takaki had hoped Akari would’ve gone home by now and not wait for him at the train station. He reaches there and finds Akari slouched next to the fire, fast asleep. He wakes her up and they both enjoy an Akari-made bento together. Takaki originally had a letter with everything he’s wanted to say to Akari, but never had the courage to, but unfortunately during one of the stops, the high winds blew it away. Takaki was also moving away, furthering the distance between them. On the walk back to Akari’s house, they kissed. Fast forward to middle school, there’s a girl named Kanae that has a crush on Takaki. Takaki never seems to notice and appears to keep text-messaging someone. We later find out that he’s sending text-messages without a receiving address. When Kanae was ready to confess to Takaki, she realizes that Takaki’s heart is lost in some place different and there’s no way for her to reach it. Fast forward to Takaki’s adult life. It starts off with 2 people walking across the train tracks in different directions with sakura petals floating around. The woman looked like a grown up version of Akari. Takaki turns around and trains are just passing by at that moment. A series of flashback entails. It appears Takaki has returned to Tokyo and works as a programmer. A woman keeps on trying to reach him, but he ignores her call and never returns them. Takaki’s life appears to be going nowhere and he keeps dreaming of Akari. We find out later that Akari was getting married soon, but not to Takaki. Akari apparently found an old treasure box, including a letter she never had the courage to give to Takaki, but she’s only feeling nostalgic. We return to the back to the initial point of where the trains were just crossing. Takaki waits for them to completely pass and the woman is no longer there. He turns around and smiles and the movie ends. I’m guessing either middle schoolers don’t carry cell phones or this was just an atypical situation where Akari and Takaki weren’t able to contact each other during the train ride. Of course, this made the trip that much more touching. I had hoped the letter that Takaki lost would somehow end up with Akari, but unfortunately, that never happened. I’m not exactly sure who the long black hair girl with glasses is. At first, I thought it was Kanae, but they mentioned that Takaki was in a relationship for 3 years, so I’m guessing it’s someone new he met after returning to Tokyo to work. In part 2, there was was a scene with a rocket launch and couple that with the cell phone text messaging, it reminded me of Voices of a Distant Star, and thought Akari was the girl who had gone into space. After checking the sources, it appears I was wrong as the characters are completely different. I truly recommend this film to not only anime fans, but anyone who enjoys heart-felt love story. As noted earlier, I’ll only be reviewing movies I truly enjoy and The Kite Runner, A Battle of Wits, and The Orphanage have been queued for review for some time, and my decision to blog about this immediately should indicate just how incredible it is. Persepolis is actually the name of a city of Iran. I’m assuming that’s where she lived with her family and grew up. The Shah was eventually taken down and democracy was in place. However, it was shocking that over 99.9% of the population voted for Islamic Republic, which the best outcome for the country would have been some sort of socialism (helping the proletariats). Some of the key revolutionists were arrested and executed as they feared they’d spread poison into the minds of the people. I’m not exactly sure what went on, but given that this was seen through a little kid, the age of no more than 10, it makes sense that she also wasn’t exactly sure what went on. The story goes on about how many of their freedoms were removed, how woman were treated like sexual seducers if their face weren’t covered, how western culture is evil, etc. The country’s situation was already bad and then it was compounded by the invasion of Iraq. Anyway, her parents sent her to France, where she learnt to survive mostly on her own. She was obviously homesick and made some bad choices in lovers and eventually became heart-broken. She returned to Iran, where her parents were more than happy to welcome her back. Back in Iran, she just sat around the house all day doing nothing. Her parents were worried, but she wouldn’t listen to them. It wasn’t until her mami (grandmother) came and talked with her and knocked some sense into her. She meets another boy she likes in Iran, but due to strict rules of their religion, they aren’t allowed to be seen outside together. So the only thing they could do was get married and get married she did. Soon after, she starts regretting her decision and thinks her life is ruined. Her mami (grandmother) comes to aid once again and explains that there’s really nothing to fret over a divorce and if she is truly unhappy in this marriage, she’d find more happiness after the divorce. Parties (due to mingling of mix gender) and alcohol are illegal in Iran, so people hold private parties. One time, patrolling police officers overheard their party and crashed in. The boys ran and hid on the roof, while the girls stay in the apartment. The officers chases the boys. All of the boys jumped onto a different roof. One boy got scared and stop, but when he tried, he didn’t make it. After this experience, Marjane couldn’t stand the oppression anymore and decides to leave the country, once and for all. Once again, it’s heart-breaking for the family, but they knew it had to be done. She never saw her grandmother again as she had died shortly after. The story ends with by returning to the present as she leaves the airport. You can obviously tell she’s still internally conflicted, as she might never see her parents and friends anymore. People at the airport are looking at her weird, since she looks like she’s middle eastern. However, she’s no longer afraid to admit she’s Iranian. Persepolis is a very powerful story about the oppression in Iran. Not only was the story done exceptionally well, using black and white to tell the story gave it a very solemn feeling. The characters were drawn and developed really well also. I’d definitely recommend this movie.